Department of Pharmaceutical Sciences, Faculty of Pharmacy, Mulawarman University, Samarinda 75119 East Kalimantan, INDONESIA. Department of Pharmaceutical Sciences, Faculty of Pharmacy, Universitas Indonesia, Depok 16424 West Java, INDONESIA. Department of Chemical Engineering, Faculty of Engineering, Universitas Indonesia, Depok 16424 West Java, INDONESIA. The aims of the study was to explore the application effect of ionic liquid as a green solvent in the polyphenolics content extraction from Peperomia pellucida (L.) Kunth herbs using 1-butyl-3-methyl imidazolium bromide ([BMIM]Br) and 1-butyl-3-methyl imidazolium chloride ([BMIM]Cl). The polyphenolics content extraction was performed by using the ionic liquid based microwave-assisted extraction (IL-MAE) method with some extraction parameters, including extraction time, microwave power, ratio liquid-solid, and ionic liquid concentration. The yields of total polyphe nolic content were examined using a microplate reader 96 well method, and the extraction mechanism was analyzed using scanning electron microscopy (SEM). The results showed that the effect of ionic liquid on the yield of total polyphenolics content, including 18.287 µg GAE/g (0.7 mol/l [BMIM]Cl concentration, 14 ml/l liquid-solid ratio, and 270 Watts microwave power for 10 minutes), and 15.734 µg GAE/g (0.7 mol/l [BMIM]Br concentration, 14 ml/l liquid-solid ratio, and 270 Watts microwave power for 15 minutes), whereas the SEM demonstrated the extraction mechanism with significant physical changes in matrix sample after treatment using different solvents. Application of green chemistry principles using an ionic liquid as a green solvent for the polyphenolic extraction of P. pellucida herbs to be rapid, easy, and efficient. Peperomia pellucida (L.) Kunth herbs is a Piperaceae family and can be found in wet environments throughout the territory of Indonesia. It is traditionally used as an analgesic, anti-hyperuricemic, anti-diabetes mellitus, and antihypertension.1 Some studies have reported the pharmacological properties of this plant such as antihyperglycemic oxidative stress, dyslipidemia in diabetic rats,2 anti-inflammatory, analgesic activity,3 and antihypertension.4 Also, reported the content of secondary metabolites including essential oil, terpenes, alkaloid, phenols, and flavonoids.5 Some polyphenolic compounds such as quercetin,4 chromenes,6 dillapiole,7 xanthone patulosida A,8 peperomins,9 and pellucidin A10 were isolated. P. pellucida has the potential as a medicinal plant, however, until now, it has no economic value and weeds for farmers, especially in palm oil plantations. This plant has not been utilized for commercial purposes as a raw material of herbal medicine because it has a low yield value. Application of green extraction for secondary metabolite extraction of this herbs is expected to be developed and utilized to produce the potential commercial products. The ionic liquid is a green solvent that has the flexibility of ions combination to adjust the physicochemical properties of the target compounds and potential to replace the organic solvents that are flammable, volatile, and toxic.11 In addition, the targeted compounds can be improved by considering safety, toxicological, economics, and environmental impact standpoint.12 The application of ionic liquid as a green solvent in extraction process performed a non-conventional extraction method such as microwave, supercritical fluid, ultrasonic, countercurrent, and so on.13,14 However, some studies have reported the application of ionic liquid-based microwave assisted extraction in extracting secondary metabolites.15-18 The target compounds have been successfully increased the yields using an ionic liquid as a solvent, including trans-resveratrol from Poligani cuspidati,17 quercetin from Psidium guajava,16 orientin and vitexin from Trollius chinensis,19 flavonoids from Scutellaria baicalensis Georgi,18 and diosgenin from Rhizoma dioscoreae.20 In previous study, this method has been successfully applied for extracting secondary metabolites in the herbs.15 However, the application of 1-butyl-3-methyl imidazolium bromide and 1-butyl-3-methyl imidazolium chloride as a green solvent to extracting the polyphenolic content from P. pellucida herbs has not been reported. Additionally, the use of conventional organic solvents on the secondary metabolites extraction from plants can produce high residual solvent and low efficiency. Therefore, the objective of the study was to explore the effectiveness of the IL-MAE methods using the ionic liquid as a green solvent. A sample of P. pellucida was collected from North Mamuju, West Sulawesi, Indonesia and was identified at the Herbarium Bogoriense, Bogor Botanical Garden, Bogor, West Java, Indonesia. The voucher specimen was deposited at Laboratory of Pharmacognosy–Phytochemistry, Faculty of Pharmacy, Universitas Indonesia, Depok, West Java, Indonesia. The chemicals were used in this study, such as methanol for analysis, aquadest, ethyl acetate, n-hexane were purchased from PT. SmartLab Indonesia, Indonesia. 1-butyl-3-methyl imidazolium bromide ([BMIM]Br) and 1-butyl-3-methyl imidazolium chloride ([BMIM]Cl) were purchased from Shanghai Chen Jie Chemical, China. Folin-Ciolcalteu reagent, sodium carbonate, and gallic acid standard were purchased from Sigma-Aldrich (via PT. Elo Karsa, Indonesia). The equipments were used including Modena Microwave 900 watts (Buono-MV 3002, USA), Rotary evaporators (Buchi, Germany), Vortex mixer (Stuart, Germany), Spectrophotometer UV-VIS (VersaMaxTM ELISA Microplate Reader, USA), Micropipette, and JOEL scanning electron microscope (JSM-5510LV). The dried powder of samples (3 gram) were macerated with 50 ml n-hexane, allowed to stand for 24 h, filtered and evaporated to obtain a dry extract. Furthermore, the residue was remacerated using ethyl acetate with the same procedure. An ionic liquid based microwave-assisted extraction (IL-MAE) method was used to extracting polyphenolic content based on literature.15,17-21 Briefly, the dried powder of samples (3 gram) was mixed with an ionic liquid solvent then extracted using an IL-MAE (Modena 900 Watt, with slight modification) which operated under some conditions. The residue and extract solution were separated by filtering using a cotton swab and cooled at room temperature. The obtained extract solution was left for 10 to 12 hours to precipitate the desired extract. Determination of the total polyphenolic content was conducted using a microplate reader 96 well method based on literature.22,23,24 Briefly, a total of 20 µl (1000 ppm) of the extract solution or the standard solution was added to 100 µl reagent 25% Folin-Ciolcalteu solution, homogenized for one minute, and allowed for 4 minutes. Then a 75 µl sodium carbonate solution was added and homogenized for one minute. Absorbance was measured at a 750 nm wavelength using a microplate reader 96 well after incubated for 2 hours at room temperature in the dark. Gallic acid solutions (200, 100, 50, 25, and 12.5 µg/l, respectively) were used as standards and the equation was Y= 0.023 + 7.812X (R2 = 0.999). Where Y is the yields of total phenolic content, and X is the concentration of standard or sample. It was applied to determine the total polyphenolic content from the samples. Analysis of the mechanism extraction was performed with a comparison between morphological of before and after extraction process using Scanning Electron Microscopy (SEM) based on literature.25,26 Briefly, dried powder of P. pellucida herb was sown on the carbon plate and was coated with a thin layer of palladium-gold to form a conductive surface. The preparation was examined using scanning electron microscopy at an operating voltage of 20 kV and under high vacuum conditions. In Table 1, shows the combination of extraction conditions using four factors and three levels with a total of 64 combinations. It was consist of extraction time (10, 15, and 20 minutes), microwave power (90, 270, and 450 Watts), ionic liquid concentration (0.2, 0.7, and 1.2 mol/l), and liquid-solid ratio (10, 12, and 14 ml/g) against the yields of total polyphenolic content. Table 2 and Table 3, demonstrated the combination effect of extraction condition using [BMIM]Br and [BMIM]Cl with ionic liquid based microwave assisted extraction method. According to the results in Table 2 was obtained the 10 highest of yields with the combination of extraction condition factors and the best yields (15.734 µg GAE/g) using [BMIM]Br as a solvent. Whereas, the results in Table 3 was obtained the best yields (18.287 µg GAE/g) and the 10 highest of yields using [BMIM]Cl. 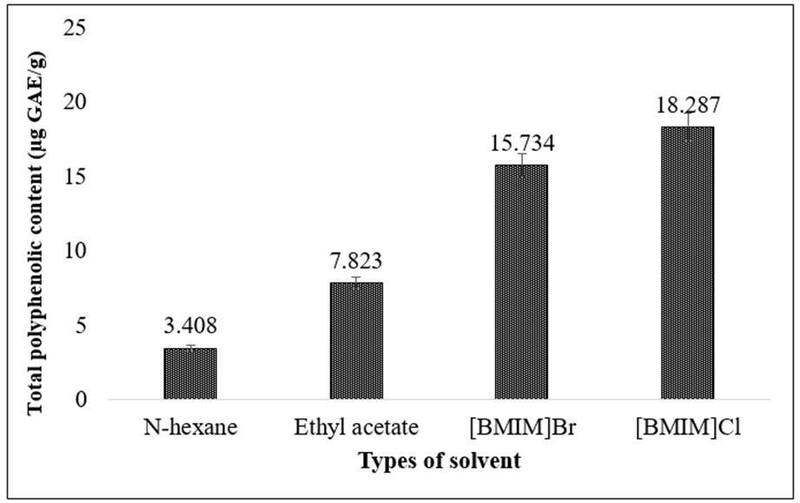 Comparison of efficiency level between an ionic liquid as a green solvent and conventional organic solvent shown in Figure 1. In Figure 2, shows significant physical changes in matrix sample after treatment with different solvents. Based on the result, described the changes of cell wall surface in matrix samples that have been extracted using the IL-MAE compared to the maceration method. P. pellucida herb is a plant rich in pharmacological properties. However, the plant has not utilized as raw materials for commercial herbal medicines because it constrained by the various factors such as cultivation, standardization, optimal results, optimal extraction methods, and so on. Development of extraction method is one of the factors that play a major role in obtaining the optimum yields. Application of ionic liquid as the green solvent is expected to be a solution in the development of extraction method by considering the green chemistry principles which to be the main objective of this study. The IL-MAE method aims to apply the green chemistry principles in the extraction process of a secondary metabolite from this herbs. The extraction process was conducted based on the previous study.15 It was performed using some combinations of the condition factors, including extraction time (minute), microwave power (Watts), ionic liquid concentration (mol/l), and the liquid-solid ratio (ml/g) on the yields of total polyphenolics content compared with maceration or conventional method. The highest of yields of total polyphenolics content was obtained from the IL-MAE method using [BMIM]Cl with amount 18.287 µg GAE/g. Experimental design based on the combination of extraction condition factor using ionic liquid based microwave assisted extraction (IL-MAE). The application of ionic liquid based microwave assisted extraction using 1-buthyl-3-methylimidazolium bromide ([BMIM]Br) as a solvent. The application of ionic liquid based microwave assisted extraction using 1-buthyl-3-methylimidazolium chloride ([BMIM]Cl) as a solvent. The SEM analysis aimed to determine the surface changes and cell wall matrix (sample) caused by the extraction process either by maceration or ILMAE method. 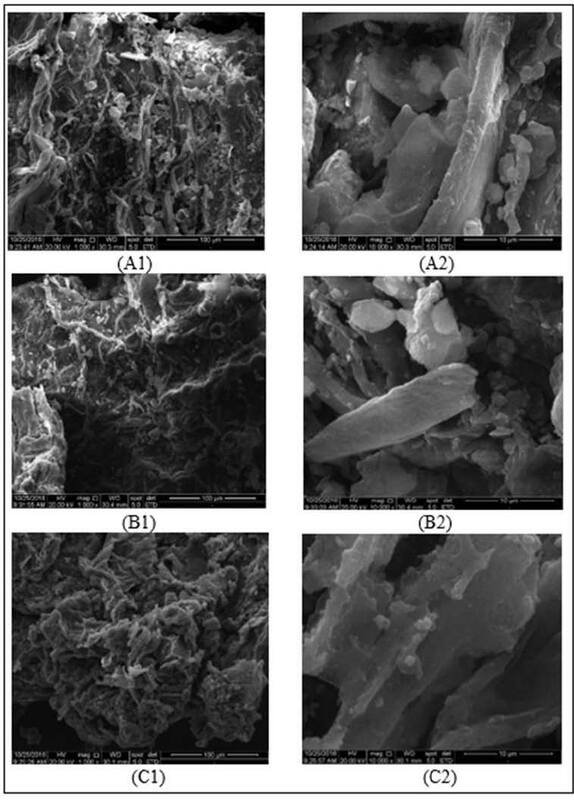 Some studies have reported the effect of surface changes and cell wall matrix by using ionic liquid solvents.18,29,28 The microstructures of the samples were clearly apparent changes after extraction using IL-MAE compared with conventional methods. The efficiency of IL-MAE extraction could be attributed to the ability of the microwave to cause damage to the cell wall surface, thus facilitate the release of the solute in the sample matrix into solution (solvent).12 Furthermore, the changes have a correlation with the yields of total polyphenol content was produced by the maceration and the IL-MAE method. The efficiency of the IL-MAE method was much higher than the maceration method that caused damage to the cell wall surface of the sample matrix. The role of ionic liquids in the extraction process of medicinal plants is not only limited to the increased interaction between solutes and solvents but may also be associated with the solvents used which cause modification of changes in the interaction of the permeability of the plant matrix.30 Therefore, the characteristic of ionic liquids to influence the conformation of carbohydrates through hydrogen bonding and can be considered as viable substituents to be value-added solvents when compared to classical extraction methods. While the use of microwave-assisted extraction is known to cause a cells tissue interference by a microwave irradiation will contribute additionally to facilitate the overall process. Scanning electron micrographs of P. pellucida herb samples: (A) Untreated P. pellucida sample (A1 is the 100 µm image, A2 is the 10 µm image); (B) after maceration (B1 is the 100 µm image, B2 is the 10 µm image); and (C) after IL-MAE (C1 is the 100 µm image, C2 is the 10 µm image). Based on the above results, the use of ionic liquid as a green solvent ([BMIM]Br and [BMIM]Cl) can be applied to extracting polyphenolic compounds from P. pellucida herb. The extraction of a secondary metabolite targeted from this herb becomes more efficient, easy, and rapid. For further research, it is necessary to optimize the extraction methods to obtain target secondary metabolites. Heyne K , author. The Useful Indonesian Plants. (Third Edition). Research and Development Agency, Ministry of Forestry, Indonesia. (Jakarta). 2007;1–462. (In Bahasa).